The Premier League 2 top goal scorer has got his reward for his fantastic season so far with a contract extension just before the Tyne-Wear derby. Newcastle United's under 21 number nine has been handed a new contract after scoring 19 goals in the first of the Premier League 2 season. Elias Sørensen has been in red-hot form for the Magpies' second string side this season leading the line like a true number nine. Sørensen has helped himself to 19 goals in all competitions, including every game in the Checkatrade trophy so far, with rivals Sunderland up next. The young Dane was signed when he was only 16 so was difficult for him to settle into a new club with no family or friends as well as not speaking English. However, he has become one of the most promising young players at the club after finding his shooting boots this season becoming the Premier League 2 top goal scorer. This has resulted in him receiving his first cap for Denmark under 19s side in 2018. 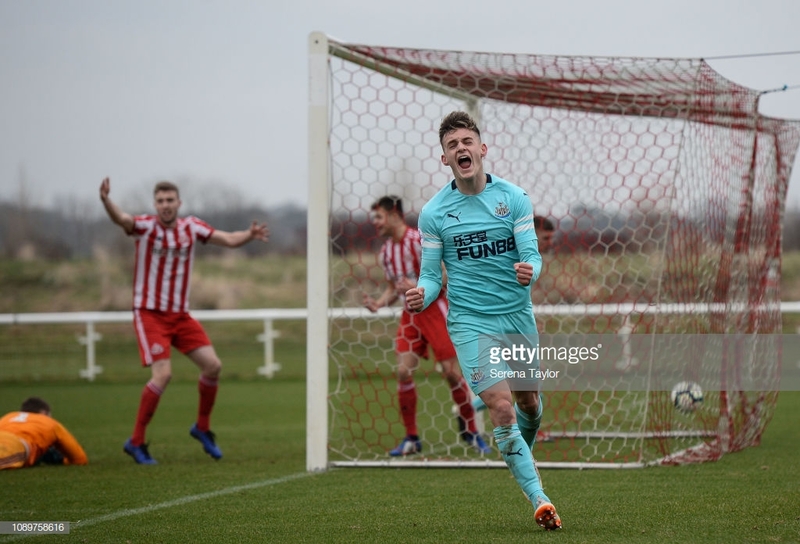 The only way is up for Sørensen now who must push on for a place in Rafa Benitez's matchday squads just like Sean Longstaff and Freddie Woodman have done this season. The Danish international was delighted to have been handed a new contract showing hard work does pay off. He told NUFC TV: "It means a lot - I've worked hard for it over the last three years or so and I'm delighted to sign with such a massive club." "I think I've done well this season and when you do well, you get your rewards." Sørensen is clearly happy to commit another three years to the club that put faith in his ability at the age of 16. "It means a lot to sign for such a big club. "When you do well you get your rewards. "When you score a few goals in pre-season you get confidence and feel more confident," he said. Sørensen also has a finishing coach back in Denmark that he sees everytime he is back home which will have contributed to his upturn in form. The Danish international will be eager to increase his tally in Premier League 2, but Benitez will be hoping the striker can go out on loan for the rest of the season to gain some experience.